To coincide with National Arts in Education Week and the beginning of a new school year, the Florida Division of Cultural Affairs installed a new art exhibition in the lobby of the R.A. Gray Building in Tallahassee entitled “Growing Tall Through Arts Education: Budding Young Local Artists.” This exhibition features a series of Sunflower Paintings created by students from Starry Night Studio in Tallahassee, owned by art instructor Kathleen R. Carter. “Growing Tall Through Arts Education” an exhibition currently showing in the RA Gray Building in Tallahassee. 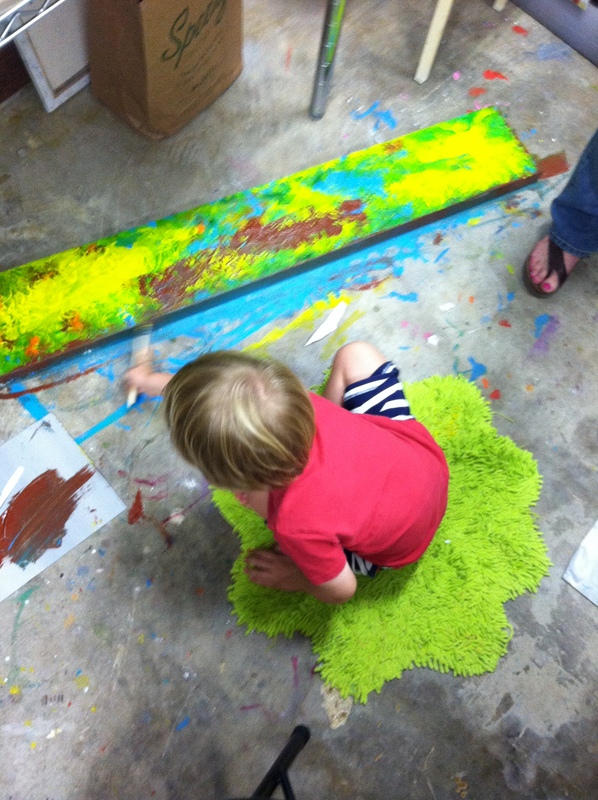 Starry Night Studio offers individual and group art classes for children and adults. For this group exhibition, some of Kathleen’s younger students produced individual sunflower paintings with acrylic paint, using a limited palette and similar size canvases to unite the installation. The long narrow canvas size was purposefully chosen to suggest the feeling of a field of tall sunflowers. Students studied pictures and paintings of different sunflowers, then individually painted their own interpretation creating the varied depictions seen in the exhibition. The majority of the classes at Starry Night focus on painting in acrylic, but other media is also taught through classes and individualized instruction. In order to focus on the development of each student, the class sizes are limited to five students at a time. Students learn classic academic methods of art including color theory, composition, brushwork, and more. 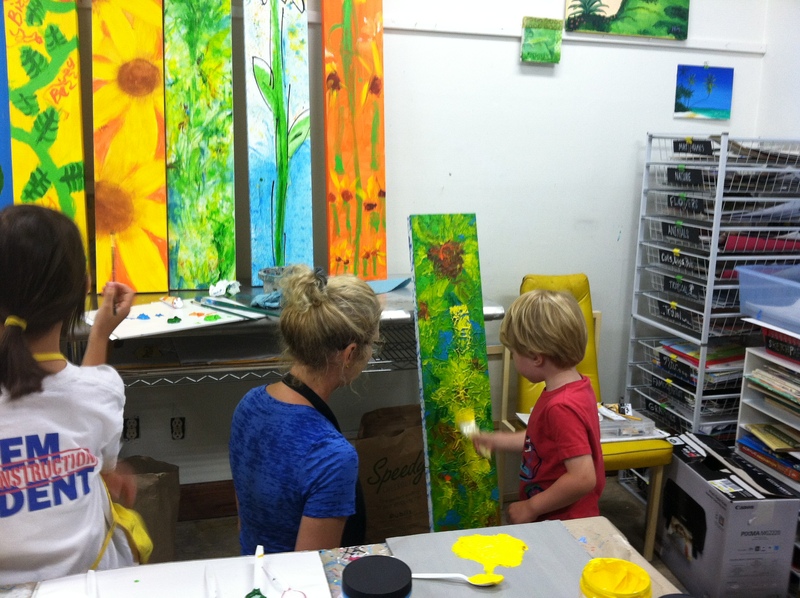 Kathleen Carter working with a student on his painting at Starry Night Studio. Photo submitted and used with permission of Morgan Lewis. 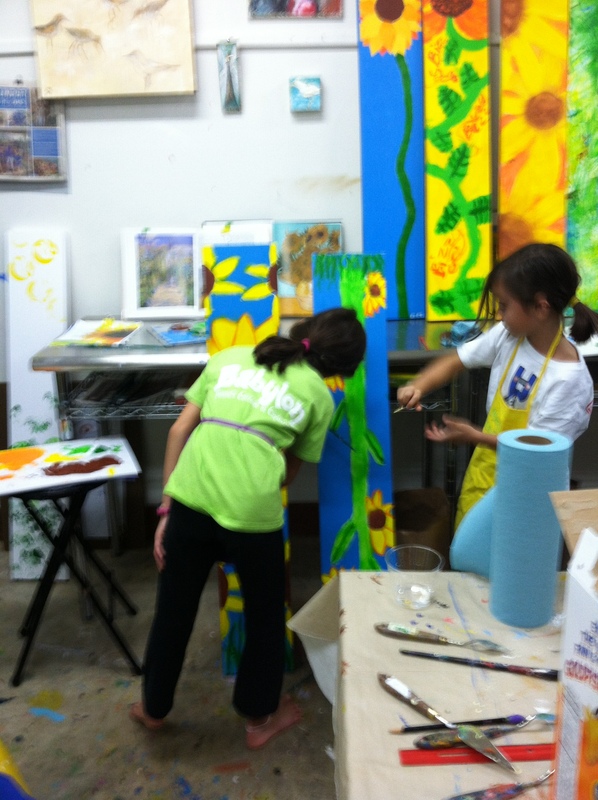 A student working on her Sunflower Painting at the Starry Night Studio last month. Photo submitted and used with permission of Kathleen Carter. Kathleen started studying with a professional artist from age 12 to 18 in Dothan, Alabama then majored in Art with a concentration in painting at Birmingham-Southern College in Birmingham, Alabama. She attended Florida State University where she received a Master’s in Art Education and continues her education through workshops at the Ringling School of Art and Design and studying with other professional artists. Kathleen has taught private lessons all of her adult life but officially opened Starry Night Studio four years ago. She has taught all ages, from Pre-K through college and currently works as an adjunct instructor in the elementary education program for Flagler College in Tallahassee. Kathleen works in oil on her own projects and commissions. In her work she experiments with all styles of art, from realistic to abstract. “As an artist and art teacher, I think it is extremely important to use art as connection, connecting people to their own ideas and to each other. Besides teaching at my studio I enjoy large collaborative projects with various populations in the community. I am actively involved in volunteer projects working with different organizations. These include Boystown, Traumatic Brain Injury Association of Florida, The Tallahassee Senior Center, The National Guard, Be The Solution, Inc., local elementary schools and businesses,” she said. Students comparing and adding finishing touches to their sunflower paintings. Photo submitted and used with permission of Kathleen Carter. 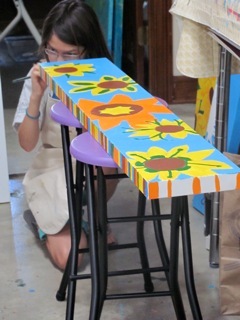 A student working on a painting at the Starry Night Studio. Photo submitted and used with permission of Kathleen Carter. Kathleen chose sunflowers as the theme for this exhibition because of the associations they have with the artist Vincent Van Gogh and the feelings of happiness the bright flowers can evoke. Just recently, Tallahassee has adopted the sunflower for inclusion with the “Talla-Happy” marketing campaign. Sunflowers also reflect the importance of arts education. As young students, the exposure to artistic disciplines like dance, music, theatre, media arts, literature, design, and visual arts plants a seed of creativity that can positively impact all future pursuits. And in addition to helping them in other subjects, the arts also make them more curious, engaged, and well-rounded citizens. As the economy moves forward, creativity through training in the arts will be a key element to Florida’s future success. While National Art in Education Week may be over, artists and teachers like Kathleen understand that teaching the arts is a year-round passion. The Division of Cultural Affairs supports the view that the arts build cultural understanding, mutual respect, and strong communities, and supports arts and culture as an integral part of education and lifelong learning for all Floridians. Learn more about arts education at the Florida Division of Cultural Affairs Arts in Education page. You can find Starry Night Studio on Facebook or contact Kathleen Carter at artsmethods@comcast.net. “Growing Tall Through Arts Education: Budding Young Local Artists” will be on display in the R.A. Gray Building through the end of September. This entry was posted in Art Education, Spotlight On and tagged Art Education, Arts Advocacy, culture builds florida, Kathleen Carter, Starry Night Studio, Tallahassee by culturebuildsflorida. Bookmark the permalink. It is so important for children’s development to be exposed to and experience the arts at an early age. This is an encouraging step in reinstating the arts in our schools. Although it sounds like Ms. Carter offers a wonderful art program, I find it a little frustrating that the subject is about Arts Education, yet Ms. Carter cites no classroom experience outside of her own programs. Programs like hers are extremely valuable, yet should NEVER be a substitute for quality arts programs, taught by a certified art educator, in every school. Sending a message that programs outside of the classroom are Arts education, gives decision makers the impression that their programs are expendable. I won’t get on my soapbox about the why’s… but I would like to see more focus placed on advocacy to strengthen the constantly crumbling arts programs in Florida’s schools. I also find it a little unsettling that Ms. Carter teaches pre-service teachers at the college level, without having a range of classroom experience. This proves the disconnect between reality and Academia that colleges are so often criticized for. I would love to see more articles addressing the amazing programs within Florida schools… wouldn’t it be wonderful when decision makers are trying to out do each other to get those programs in their schools? Arts education can certainly happen outside the classroom as we believe that arts education should be a lifelong endeavor. Ms. Carter is a certified and very skilled educator who has worked in the classroom many times. That being said, OF COURSE programs like these are not meant to replace quality arts programs in the schools. For information about advocacy for arts education, we encourage you to check our education page (link in the article) and the Florida Alliance for Arts Education (http://www.faae.org/) which is one of our grantees. We hope you reach out to your legislators and community leaders to advocate for arts education, and we’ll happily share stories about the important of arts programs in our schools here on the Culture Builds Florida blog! Your work with children is inspiring. I am sure your students are learning important critical thinking skills, problem solving skills, and developing a wealth of talent and self confidence. You and your studio are touching so many lives. This is wonderful.